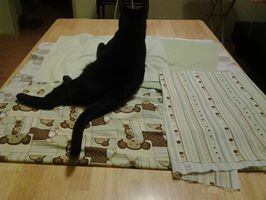 My feline overlord, Anubis, finds the whole fabric thing to be amusing. I sew so little these days that he becomes perplexed by the process and, eventually, thinks it is a game or he becomes insanely jealous over the attention the fabric is getting. I pressed the cotton fabrics for the first quilt. 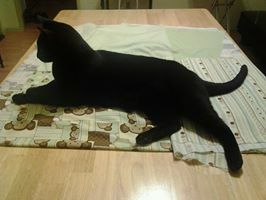 As soon as I placed the pressed lengths onto the kitchen/work table, there was Anubis to lay down upon them. The multi-printed fabric of monkey faces, dots, and stripes is the backing fabric. 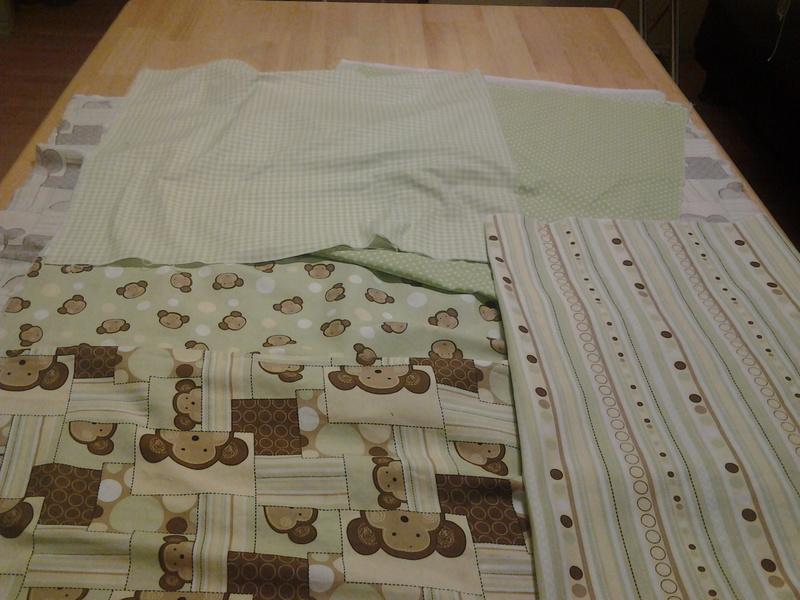 The others are for the quilt squares and binding: white & green gingham, green with white polka dots, dots and stripes, and monkey faces with dots. I hope I have enough for the intended pattern & the binding as the prints were in limited supply to begin with and the base colors are nearly impossible to match. I went through every bolt of fabric at the store trying to find shades of green, yellow, and brown that matched to supplement the prints but to no avail which resulted in the purchase of the considerably more expensive polka dot and gingham prints as their shade of green was closest to that of the monkey prints and stripes.